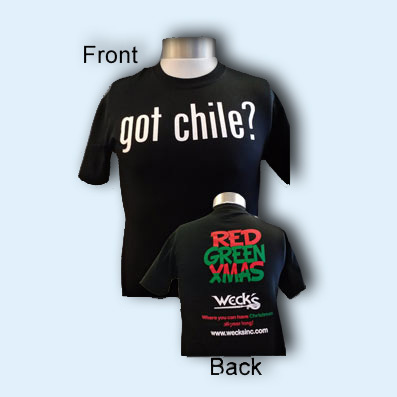 Time to show your love for the Weck’s Papas With an original “Got Chile?” T-shirt! 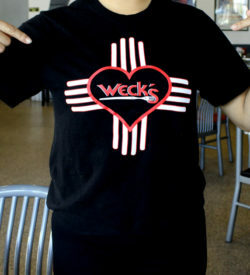 Get this one of a kind shirt soon, great for a gift. Front: Got Chile? Back: Red Green Xmas – Where you can have Christmas all year long! 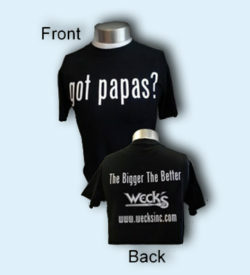 The Shirt is made from 100% Pre-Shrunk Cotton and comes only in black with red, green and white lettering.